This example site is located in the west of the Ivory Coast within the natural zone of transition between evergreen forest and savannah. The remaining forest blocks in the area are generally considered relics of the natural high semi-deciduous forest. Historic management practices of selective wood cutting however, have led to a general depletion of the forest canopy, locally accentuated in a fragmented canopy featuring insular gaps. These gaps are generally smaller than one hectare and are occupied by a low vegetation cover consisting of mixed shrub and young secondary tree species. Perception of this kind of subtle and small scale disturbances in forest canopies is seriously hampered by the interfering effect of speckle noise. Both visual interpretation and digital classification require optimal restoration of the underlying scene radiometry with maximal preservation of structural elements. Within this site, a representative area of about 6x5 km featuring the typical forms of canopy fragmentation as well as some small rock outcrops (Inselbergen) was selected. Field work carried out in 1994 confirmed the position and extend of the gaps observed on the SPOT panchromatic reference image (Bottom Right). The ERS-1 images used (Upper Left) were acquired during the dry season (23 Feb. 1993, in green) and at the end of the rainy season (30 Nov. 1993, in red). In the latter image, relatively high backscatter levels are observed in less densely vegetated areas. In these images (C-VV band, 3-look, resolution: 22x25 m; pixel size: 12.5x12.5m), the differences between the forest cover and shrub vegetation in the gaps can only be vaguely observed.>BR>Some zones of brighter return can be marked out, but their perception is obscured by the interference of speckle noise and scene texture. After speckle filtering using the Improved Gamma-Gamma MAP speckle filter (Upper Right), the insular gaps can be discriminated more clearly based on both their radiometric and textural appearance. The edges between the brighter and more homogeneous shrub vegetation and the forest respectively, as well as structural elements (inselbergen, and exploitation tracks) are well preserved or enhanced at the original pixel spacing. The remaining distributed strong scattering effects detected throughout the forest area, are associated with the specific coarse texture of a forest canopy with an incomplete crown closure in the upper layer. At the given incidence angle of the ERS-1 SAR sensor, even small canopy openings allow for the appearance of local strong scattering effects at the level of trunk and branch reflection. A comparable textural appearance is observed in the SPOT image, while in this case the spatial variability is induced by the high impact of shadowing of isolated dominant tree crowns. A texture index based on the use of the spatial autocorrelation functions is illustrated in the Bottom Left image. In this representation, the most homogeneous areas (depleted areas or very fragmented forest) appear in darker tones. On the other hand, the textured areas mainly corresponding to densely forested areas are brighter. The black lines running across the forest correspond mainly to the detected structures (tracks inside the forest, etc.). 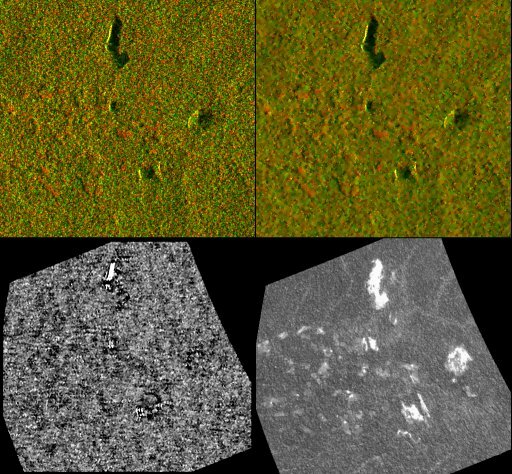 These structures, which are very thin (about 10m width on the ground), are hidden by the canopies of the trees when imaged from the side as it is the case with a SAR. They are almost indiscernible in the original ERS SAR image. Nevertheless, they are detected locally by their second order statistical properties.